This is a great idea, and I believe it has been mentioned before. Whether it has or not it is good to bring it up. There is no technological challenge in this request, all the components are available and proven. We can also change entry points, make them bigger, etc. Please compile a list of objects which you need mirrored or changed in similar fashion. If it's a long one - please assign some priorities. Does this mean there would be a button to rotate the objects left-right? Or will there be two objects in the list and the mapmaker will drag the left or right oriented one? About the priorities I agree with jeff. TheUnknown wrote: Or will there be two objects in the list and the mapmaker will drag the left or right oriented one? Last edited by Anonymous on Feb 1 2014, 17:02, edited 1 time in total. is there any time horizon for this addition/the next version of Equilbris..? 'coz I'd very much like to add one or two of these mirrored objects in a map I'm currently working on. When I completed Dragon's Fate in 2006, there was a lot of speculation on 3.6 and I started Lamentia's Story in early 2007 thinking that 3.6 would be coming out soon and I would add the new objects. Well we are still waiting. I do understand real life takes priority and I am grateful for all they have done even if 3.6 never comes out. I have abandoned my latest campaign; so I am not sure it matters to me or not. Though if it does come out it might force me to take another look at that campaign. I do have 5 of the 7 maps done; four have been heavily playtested. Jeff, well I guess I'm just being optimistic, as Dalai actually asked for a priority list, also pointing out it would be easy to implement. Also there's been recent talk about fixing moral/luck bugs, so impression is that v.3.6 is still being worked on.. But I will carry on my Work, though mirrored objects would fit some maps better/make some Things easier.. Sorry guys, no forecasts. It is being worked on, but no date that I could safely promise. Dalai wrote: Sorry guys, no forecasts. It is being worked on, but no date that I could safely promise. I am grateful for all that you are doing and the fix of the morale bug is huge; as it was very annoying. I also know some items may be easy and others very time consuming, and quality help is hard to find. The community appreciates all of the efforts of you and your team. would it be of any help, if we were to help mirror some of the desired objects and post them here? Could you add objects like these colums with flames of Chaos upon them? Karmakeld wrote: would it be of any help, if we were to help mirror some of the desired objects and post them here? No, I don't think so, but thanks. Dalai, as you've added new object to the Equlibris Mod, is it complicated Work? I'm seeking to add some modifed objects (changing excisting ones and adding them as new), but I got no idea of how to extract them and put them back in.. Any help? Can find any tread about this matter.. Yes, it is quite complicated. You may have noticed that we did not add objects of many types. For obvious reasons we started with Quest Huts. Creature Banks are quite reasonable second choice. Some types of objects are still a work in progress. For example, we tried to make a new observatory - same as old, but flaggable. No luck so far. It's not like changing some numbers in some table to convert one object into another, or create a new one. I wish it were. Dalai wrote: Yes, it is quite complicated. You may have noticed that we did not add objects of many types.. ..For example, we tried to make a new observatory - same as old, but flaggable. No luck so far. If with observatory, you mean like a flag-able Ice Spire, you can use the Outpost and change it's image. 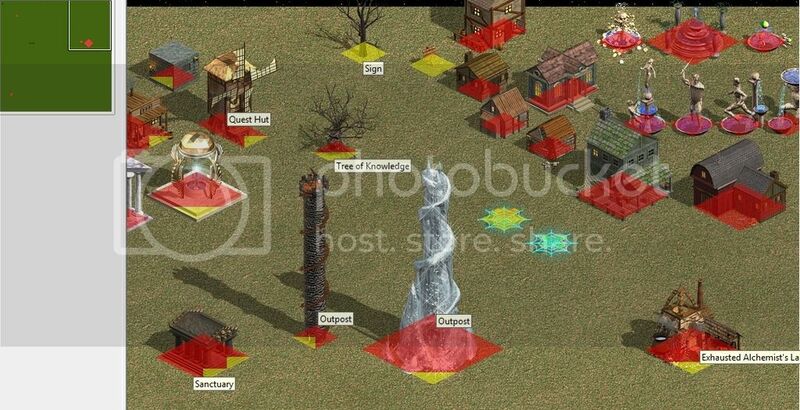 The Outposts are flag-able and offers a minor viewable area, but no image was added. You could even add the Exhausted mines. Last edited by Karmakeld on Apr 24 2017, 18:52, edited 1 time in total.